Put new life into your old furniture. Let us show you how to save your old pool furniture and your money! We suggest reconditioning furniture for less than 50% of purchasing new. We handle commercial accounts, such as apartment complexes, homeowner associations, resorts, hotels and residential too! If your old frames are chipping and peeling, we can recondition the frames by powder coating them, replacing your old straps, and installing new plastic feet to make them look just like new! Are your patio furniture straps faded or starting to break? Are your slings dirty? Do they have any tears? Is your patio furniture so old, moldy, and faded that you're ashamed or embarrassed to invite friends over for outdoor festivities? Are you in the market for new outdoor furniture? Why buy new, when you can renew? 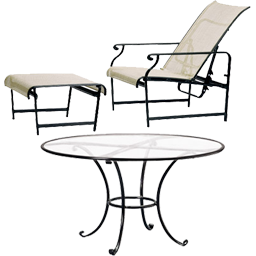 At Bennett Restrapping we renew old, dilapidated patio furniture for about half the cost of buying new. Do you want to change the colors? No problem! Do you want a custom color scheme? No problem! Your options are only limited by your imagination. When your neighbors see your custom-made patio furniture they'll think you paid an arm and leg for some new furniture because you won't be able to tell the difference. 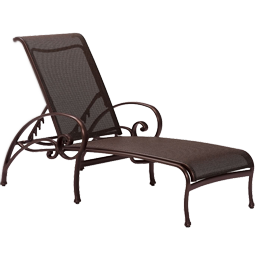 Bennett Restrapping will pick up your old but well made patio furniture, refinish and restrap the frames and promptly return your chair or lounge. We use state-of-the-art paint processes, sand blasting and 100% virgin vinyl straps. Your furniture will be transformed into brand new looking, custom-made pieces of art! Call for details and free quotes today! Quick fix delivery and pickup available. Why not get a free quote or better yet, call us at 1. 800. 637. 6265 and discuss your outdoor furniture problems with us now? We are here to service you with royalty. 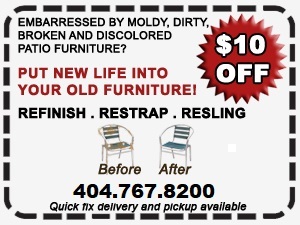 We love saving people money and we love recycling your patio furniture. No job too small. patio chair repair, chair care patio, patio chair repair, patio chair repair, patio chair repair, patio chair repair.